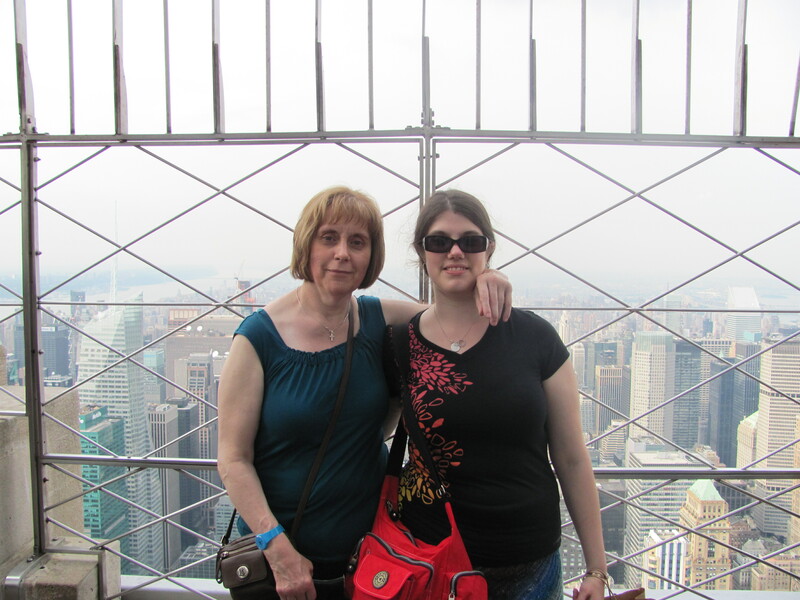 Mom and I had a great mother-daughter time. Look! A library! 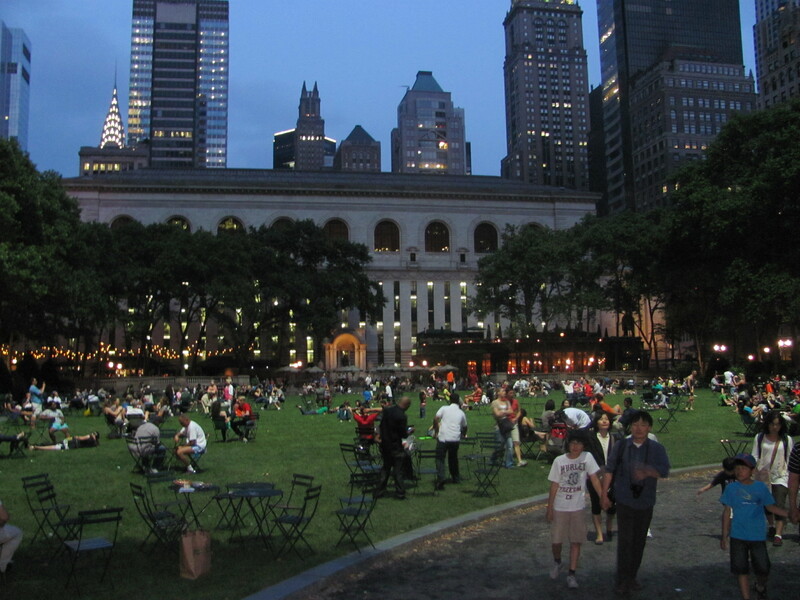 Oh, and the beautiful scenery of Bryant Park too. Just a couple more gratuitous photos (I actually managed to take some good ones so I have to share) and then there is some yarn news, I promise. 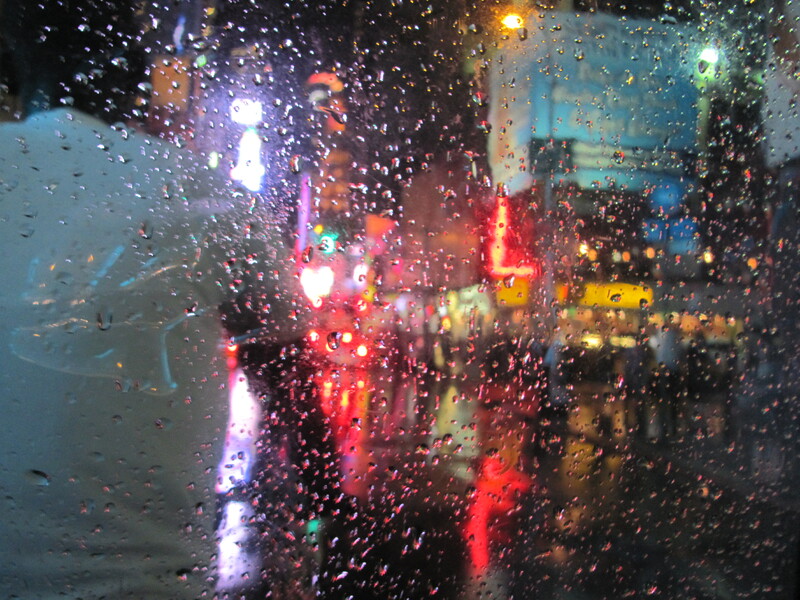 Driving through Times Square via pedicab with our awesome cabbie. Annnnd *drumroll* the Lanesplitter is finally done! I was determined to get the finishing done so I could wear it, so I did. It involved two late nights stitching in my hotel bed while mom complained about the light being on. Sorry mom! Now for more NYC related yarny goodness! Cause you know I couldn’t come home without a few skeins. I managed to talk mom into two stores. I really owe her for that. 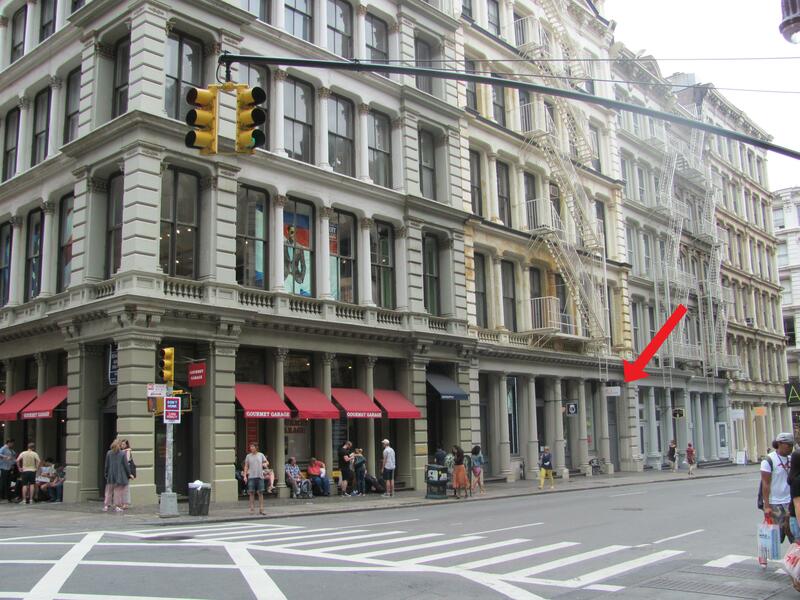 Some have said Purl Soho can have an elitist feel. I didn’t get that vibe. It has an upscale look to it, but I think this is just due to its location and the fact that it is very well laid-out and the displays are artfully done (apparently the owner used to work for Martha Stewart, so there you go). I found the staff friendly (granted there is a small possibility I may be biased since three of them commented on my Lanesplitter). The prices were usual and not inflated to my mind. We also popped uptown to hit up Knitty City and The Yarn Company. Unfortunately Knitty City was closed because it was Memorial Day. 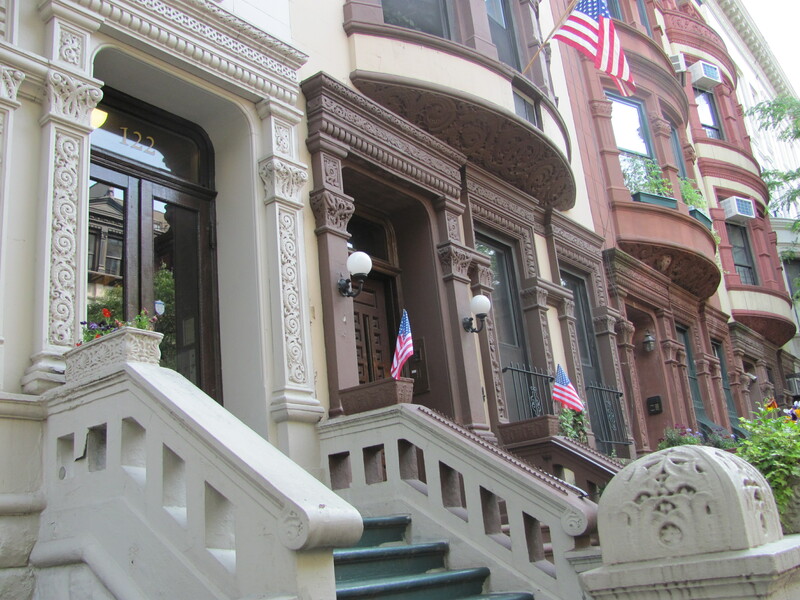 (Being two Canadians in NYC for Memorial Day of the bicentennial anniversary year of the War of 1812 was interesting timing on our part. American history classes like to gloss over the fact that we won). 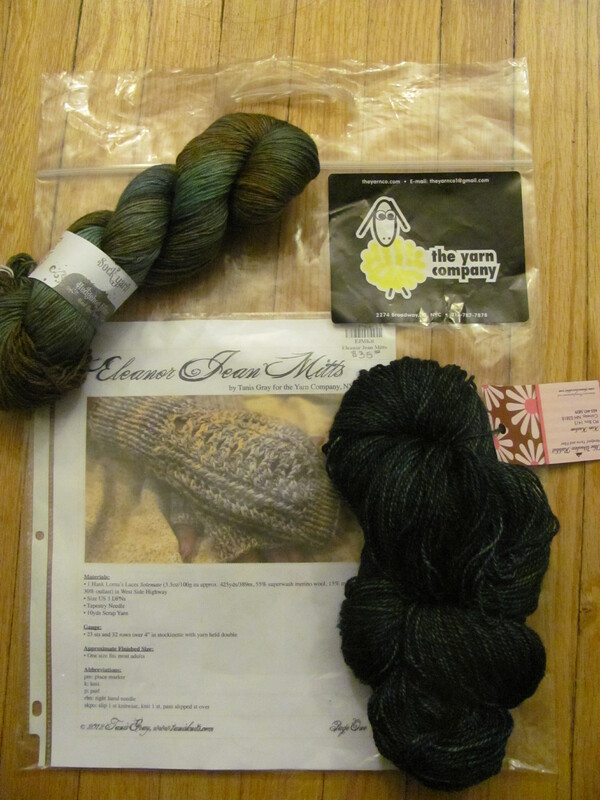 I neglected to get a photo of The Yarn Company but here’s my swag, complete with labelled bag that proves I was there. I wish I had gotten a picture of the inside: they have a huge and wide selection of yarns that is beautifully displayed. The new owners have done a bang-up job. 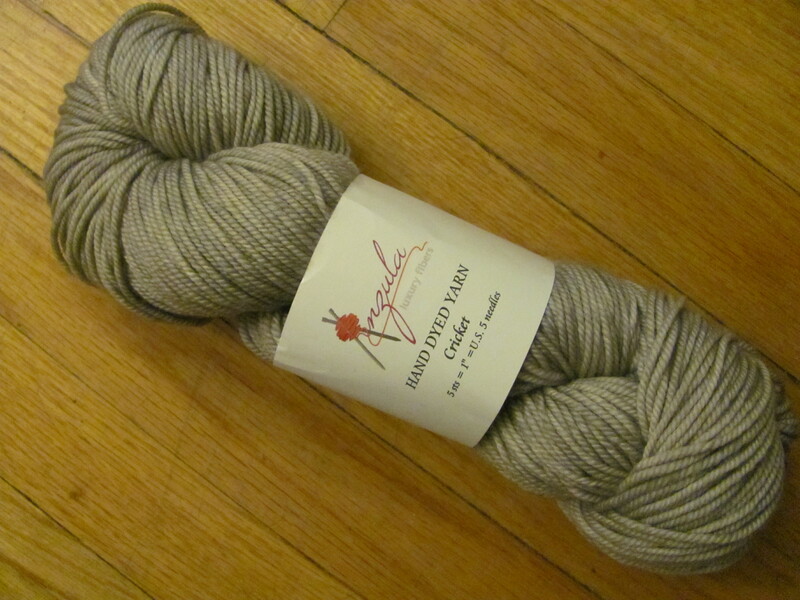 I’m excited for the Tanis Gray pattern, though funny enough that is not what the yarn I bought is destined for. 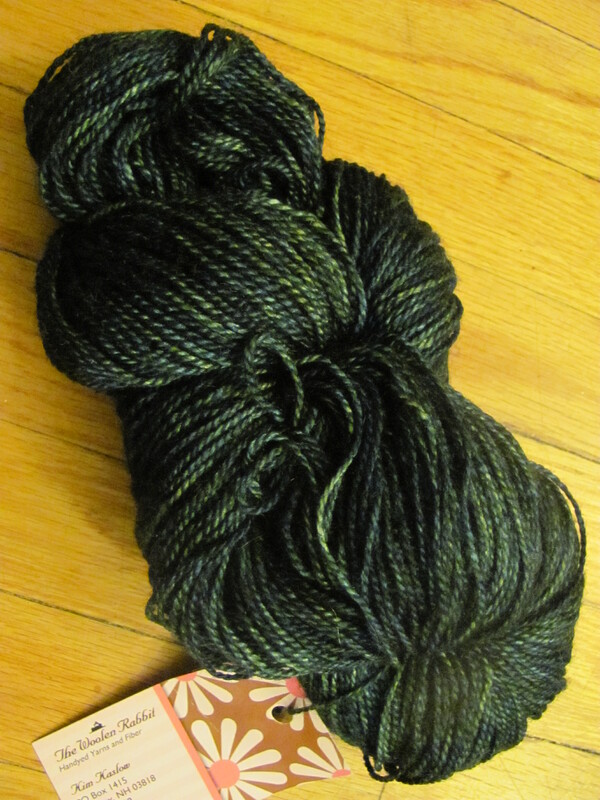 This Woolen Rabbit skein (Opulence in colourway Mystic Mountain Pine) I just got because of the deep glorious greens and the fact that I’ve never seen it in Canada. It was the last one left, so I’ll have to think of a small project for it. 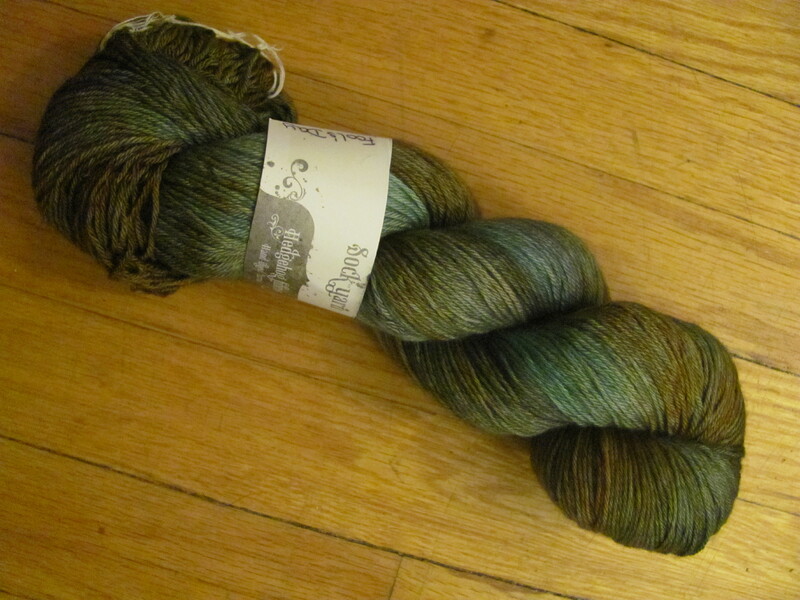 I also don’t think I have seen Hedgehog Fibers in Canada, so I picked up some sock yarn (yes, more Merino). In the Fool’s Day colourway unique to The Yarn Company to boot. I think it will be an Amiga when it grows up. Amazingly, one ball should be enough. Score! This entry was tagged LYS, patterns, travel, yarn. Bookmark the permalink. Yes, I do think you’re right about that whole glossing over of our victory thing. I believe it’s relegated to “border skirmish”. Yes… that’s quite a border skirmish, with your White House being burnt down by us and all! Oh historiography…. Beautiful photos! 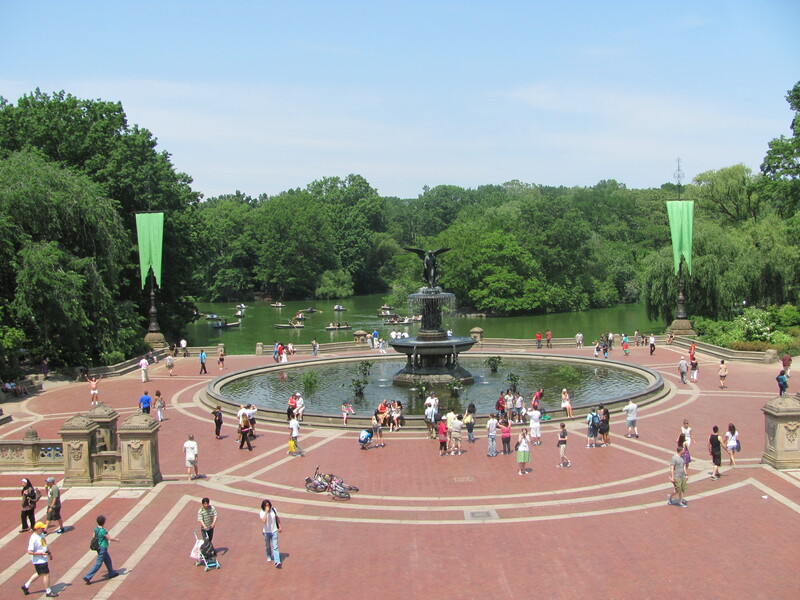 I´d love to go to NY some day… I´ve only seen places like that in movies 🙂 And that yarn looks so wonderful!!! 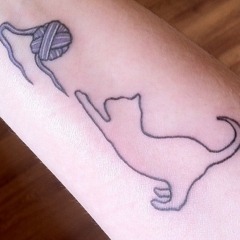 You can never have too much yarn! Thanks! And I definitely agree. Sometimes I just open my yarn chest and smile. 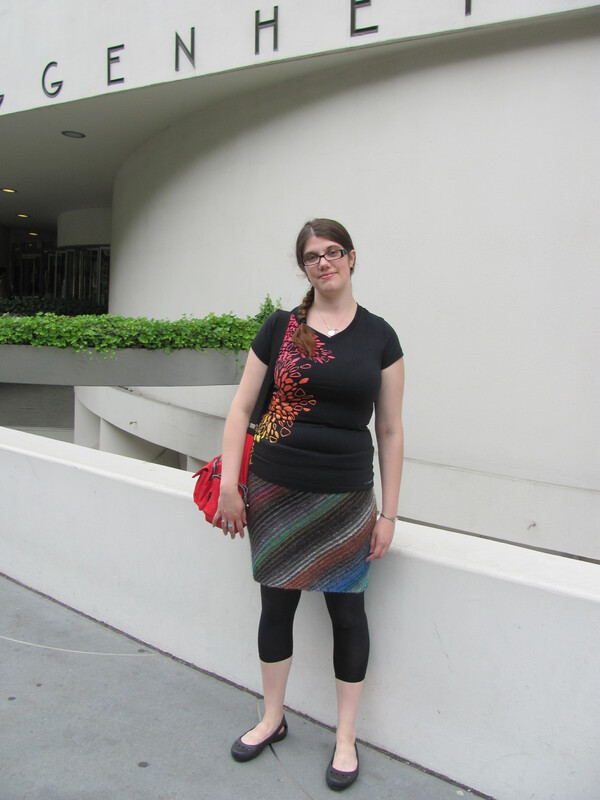 I’m originally from NYC but didn’t knit until I moved away, and Purl soho wasn’t there anyway. Is it wrong I’m so jealous of you for visiting them? lol Great photos, I’m glad you had a great trip!